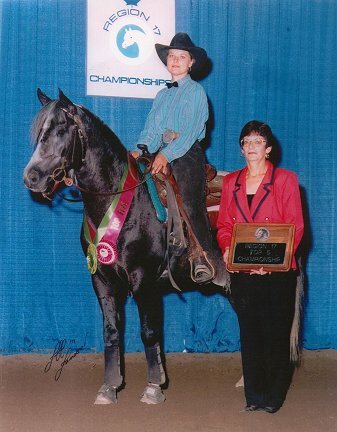 Zenzational V was shown in open reining when he was a junior horse, and won a Regional Top 5 in that division. 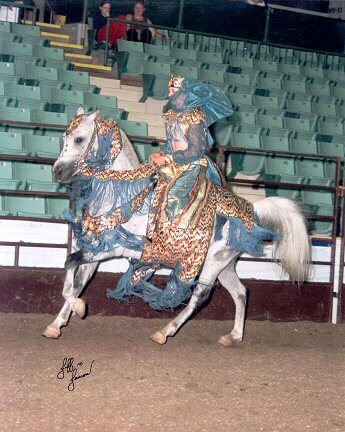 He is also a Class A winner in Native Costume. Zenzational V's sire, Desperado V is by Huckleberry Bey out of Daraska. His dam, Zahr Ann, is by Bu-Zahr (by Ferzon) out of Aalban. Zenzational V get have competed in hunter pleasure, dressage, western pleasure, native costume and halter. Zenzational V produces beautiful, athletic foals with wonderful in-your-pocket temperaments and willing minds. He has consistantly produced foals that are taller than himself. He loves people, especially children, and has been known to share suckers and other treats. Both his trainer and the person that was leasing him before I bought him have told me how gentle he is around children, and how calm he is with them when they ride him. Zenzational V does not stand to the public.